The machine is designed for quick, easy and effective cleaning of bearing bracelets. The machine has one zone for main washing. At the outlet of the machine is mounted a blow-off knife, for removing of the major amount of water, which remain on the bracelets after the washing process. The transportation of the bearing bracelets through the machine is made by a gear motor driven stainless steel conveyor belt. The transport speed can be adjusted in the range of 1,4 -2,8 m/min. Automatically water filling of the tank. Manually adding of the washing agent before starting the washing process. The water tank is equipped with a mesh drawer filter with hole size of 1,5 mm, for catching the dirt. The machine is ready for installation of an oil skimmer. The machine corpus made entirely out of stainless steel, material No. 1.4301. 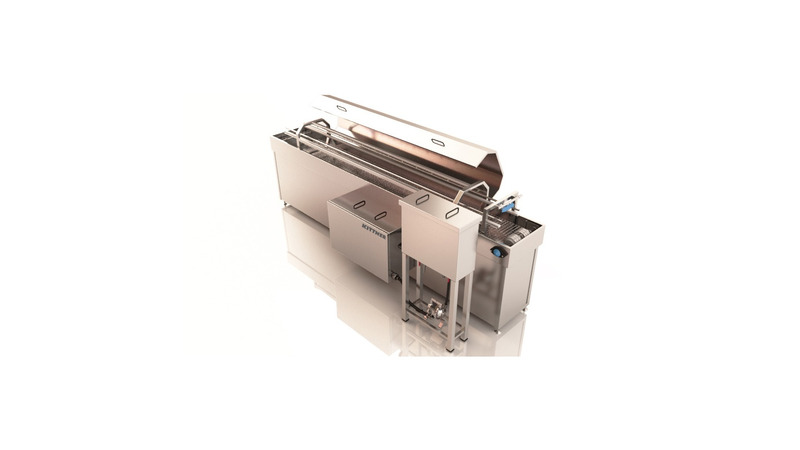 The machine complies with the high CE-Requirements and EU- and USDA regulations.